This post is sponsored by Halos. I know, I know, but they are just so good! Mandarin oranges are one of my favorite fruits, but so often the labels aren’t clear and you’ll find the fruit comes from all around the world and you never really know if they are seedless are not. And honestly, for such a small fruit, it can have a lot of seeds that are just a pain. So, I buy Halos, because I know where they’re coming from – California right here in the US, and they are seedless so I don’t have to worry about chomping down on a seed and taking away from the delicious flavor that is a mandarin orange. It’s also comforting that they’re GMO-free. While I love eating fresh mandarin oranges as a snack, I like to try my hand at cooking with them every now and then too. I was recently invited to make a recipe with Halos and the recipe that immediately came to mind was an oldie jello salad I fondly remember my mom making for cookouts and all the family gatherings. It’s an odd salad that you wouldn’t even really think about combining the ingredients for, or at least I wouldn’t. I hadn’t had it in years so I couldn’t resist giving it a try. Mr. Savvy, who spent the first several years of his childhood in Germany, might as well looked at me like I had snakes coming out of my head when I asked if he had ever had the strange concoction. 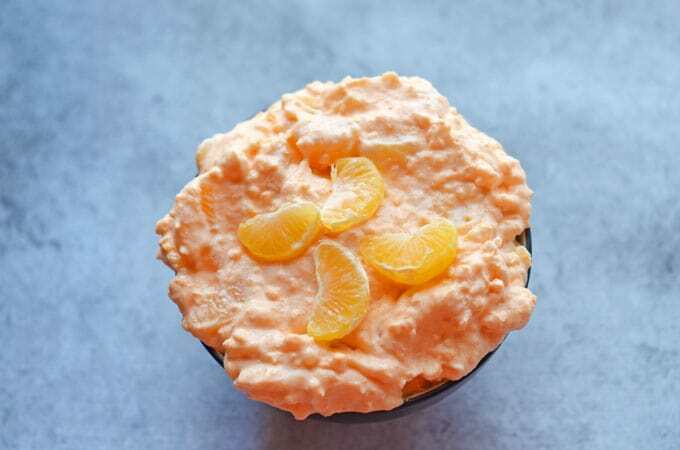 Canned mandarin oranges, cottage cheese, orange gelatin, canned pineapple and whipped topping make up the original recipe my mom would make. However, I decided to make it a bit more fresh and natural by using fresh mandarins and making my own whipped cream. 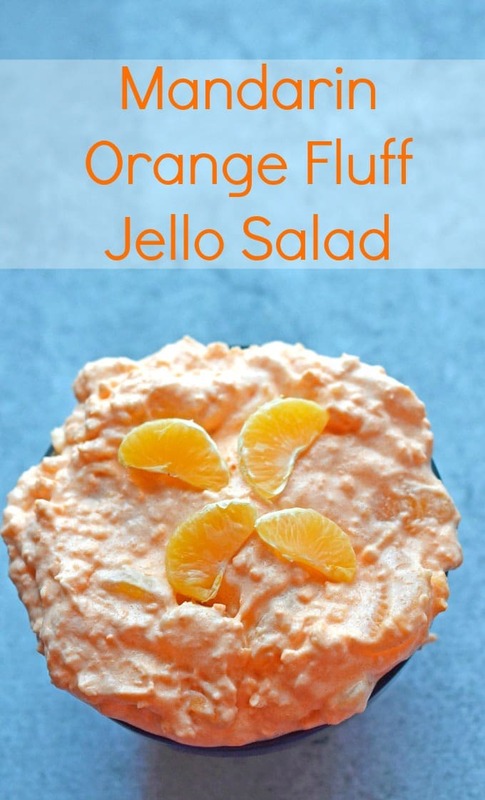 The resulting mandarin orange fluff jello salad tasted just like I remembered. 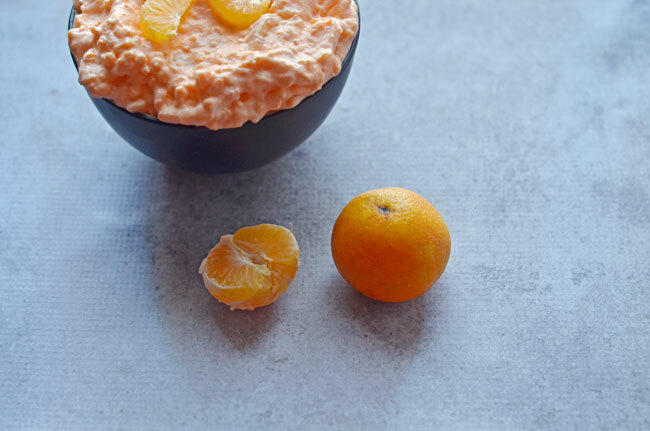 A little sweet, creamy, and full of citrus flavor. It has a variety of textures from the whipped cream, fruit, and cheese. If you want it to be purely smooth, you can run the cottage cheese through the blender before mixing it in and if you want some crunch, you can top with a sprinkle of chopped pecans. The salad is great especially during the summer months at cookouts. 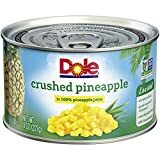 I also like it as a dessert option during the holidays. It’s a nice light, refreshing end to a heavy meal. 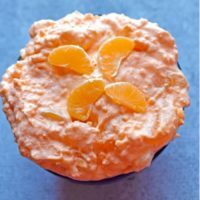 This mandarin orange fluff Jello salad recipe is light, creamy and cold - perfect for summer desserts and side dishes! In a large bowl, whip together whipping cream and sugar until soft peaks form for homemade whipped cream. Fold in the pineapple (make sure it's very well drained or it will water down the salad) and mandarin orange segments. You may want to set aside a few orange segments for garnish. 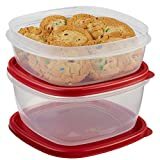 Cover tightly and refrigerate for at least 1 hour before serving. Leftovers last about 3 days refrigerated, but the salad may start watering down. 16 oz of a thawed whipped topping such as Cool Whip can be used instead of the homemade whipped cream. Hi Michelle, this would be a super contribution to Food on Friday: Everything that Wobbles over at Carole’s Chatter. Cheers and Happy Holidays! I make this salad for family parties all the time & everyone loves it. The only thing I do differently is I add Cool Whip instead of heavy cream (saves on having to whip it). I also don’t add any sugar.